Book a Tee Time Online Now! Sign up for THE INSIDER! 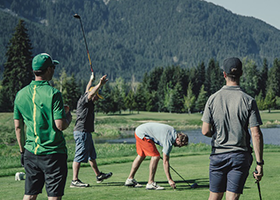 Situated in Whistler valley, just minutes from Whistler Village, and surrounded by breathtaking mountain scenery on every side, Nicklaus North is only 2 hours from Vancouver yet a world away. Leave Vancouver via Route 99 north across Lions Gate Bridge or the Trans Canada Highway across the Second Narrows Bridge. Both routes connect to follow Route 99, the "Sea to Sky Highway", north. The drive usually takes about 1 hour and 45 minutes and on a clear day offers amazing views throughout as the road twists and turns along scenic Howe Sound. Once you reach the Whistler Resort proceed through 6 traffic lights. About 3 kilometers north of the village centre, you will go over an overpass and see the golf course on your right. Watch for the sign. Turn right onto Nicklaus North Blvd. Follow the road until it ends and you've arrived. Floatplane charters can be arranged to land on Green Lake. Step off the plane and into the clubhouse that overlooks the floatplane docks. Book with Harbour Air Seaplanes for a quick and enjoyable flight. Let the professionals do the driving. A number of limousine companies in Whistler and Vancouver offer an affordable and relaxing alternative to the trip along the Sea to Sky Highway (for example: whistler.com).